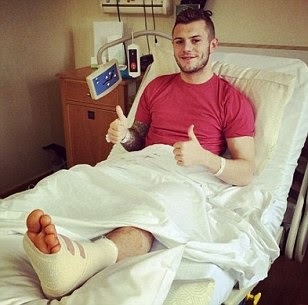 Jack Wilshere will be sidelined for three months after undergoing surgery on his left ankle. Wilshere visited a specialist on Thursday, five days after he was replaced 55 minutes into Arsenal’s 2-1 defeat to Manchester United after complaining of discomfort. The England international has a long history of ankle problems – he missed the entire 2011-12 season as he battled to overcome a stress fracture – and he is set for another spell on the sidelines after a specialist advised surgery, which was carried out on Thursday afternoon. “Jack Wilshere has had successful surgery on his left ankle and will be out for approximately three months,” a statement from the club read. “The England international sustained the injury to his ankle ligaments during the Premier League match with Manchester United on Saturday at Emirates Stadium. “An assessment with a specialist confirmed the need for an operation and the 22-year-old had successful surgery to his ankle in London on Thursday afternoon. “Jack will now commence his injury rehabilitation programme with the Arsenal medical team.